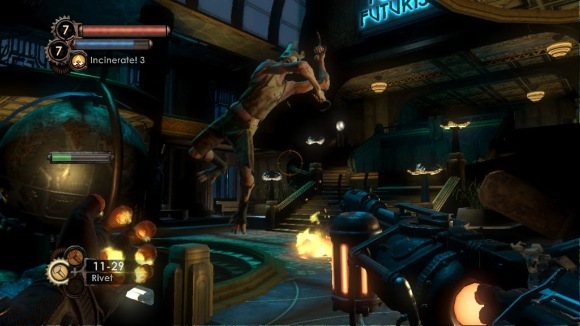 As much as the developers of BioShock 2 at 2K Marin were eager to show us their game in action, they were (quite pleasantly) even more eager to talk about it. Following the conclusion of our demo walkthrough, lead designer Zak McClendon, lead environment artist Hogarth De La Plante and lead level designer JP LeBreton opened the floor to questions from the half-dozen game journos in attendance. Read on after the break for the team’s take on revisiting the first game’s mysteries, the intricacies of plasmid mixing, the return of Vita-Chambers and more. This entry was posted in Demo, Gaming, PS3, Xbox 360. Bookmark the permalink.